And here we have another story that’ll make you shake your head and say “What is happening to our country?” Since when does displaying a flag in support of police incite violence?? Apparently… since NOW! Todd Starnes over at Fox News American Dispatch posted this story. A group of firefighters in Riverside County, California wanted to honor police officers killed in Baton Rouge and Dallas. So firefighter Eric Hille decided to display a pro-police flag on one of the fire engines at Sunnymead Ranch Station 48. It’s a sad state of affairs when expressing support for the very people sworn to serve and protect us is somehow considered “divisive” and even worse, possibly dangerous to other first responders like our firefighters. 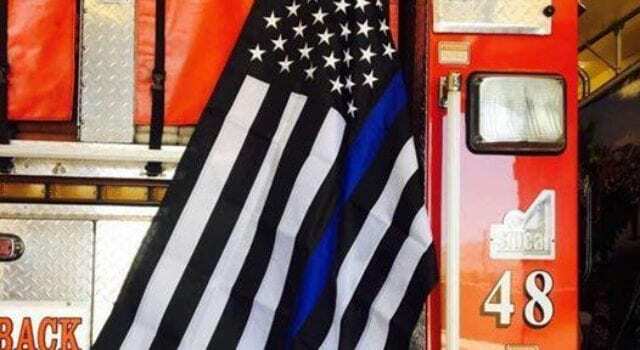 While his concern might be valid in some communities, it might have been a better show of solidarity to fly the flag anyway, and if necessary, work together with local law enforcement to ensure the firefighters’ safety. Capitulating to bullies is NEVER the right answer. And read firefighter, Eric Hille’s post and see the photos. Previous articleWHAT is happening to our country?!?! Hate cops… call a crackhead!